I had amassed the “Spanglish” library during my baby shower, when I asked friends and familia to gift me with their favourite children’s books in both English and Spanish. Even when he was too young to understand what I was saying, I would read to Javier on our rocking chair, the same one his Colombian grandmother used to sit on to read to his own father when he was a little boy. 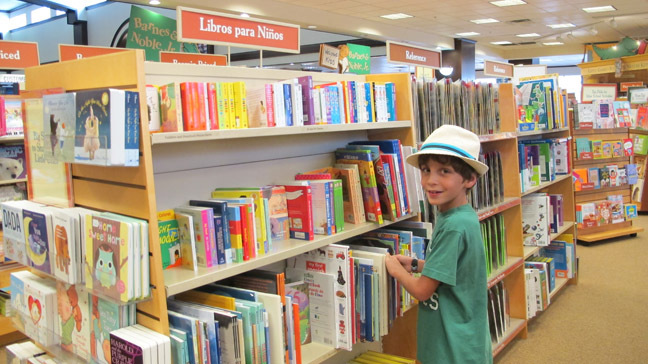 In the meantime, I take advantage of Hispanic Heritage Month and make a trip to the bookstore each year to pick up new Spanish books we can read together. This year we were thrilled to discover that one of his favourite series, The Diary of a Wimpy Kid, is available in Spanish, so we piled up on those. While the stories themselves don’t necessarily have a cultural connection to our community, at least they’re in our native language, which connects him to our heritage. Ana Connery is an accomplished storyteller whose writing has appeared in a variety of magazines and websites, including Yahoo! Parenting, Parade, and the Huffington Post. Formerly the content director of Parenting, Babytalk, Pregnancy Planner, and Conceive magazines as well as parenting.com, she’s also held senior positions at some of the country’s most celebrated magazines, including Cooking Light, Latina, and Fitness. Ana frequently appears on "The Today Show," "Good Morning America," and CNN as a parenting expert. She has interviewed the country’s top pediatricians, psychologists, and educators, including U.S. Secretary of Education Arne Duncan and First Lady Michelle Obama, as well as celebrity mums including Jessica Alba and Bethenny Frankel. You can find her on Twitter (@apconnery) and Instagram (@apconnery).